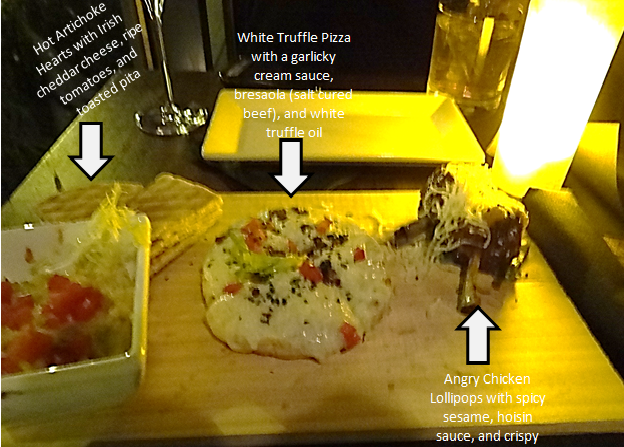 Dinner for two at Ayza Wine and Chocolate Bar was a nice way to end the weekend. I discovered they recently opened a location in the West Village. The atmosphere is romantic and the food is delectable. We shared a platter of appetizers, perfect for 2, that included: Hot Artichoke Hearts with Irish cheddar cheese, ripe tomatoes, and toasted pita; White Truffle Pizza with a garlicky cream sauce, bresaola (salt cured beef), and white truffle oil; and Angry Chicken Lollipops with spicy sesame, hoisin sauce, and crispy rice noodles. As an entrée we enjoyed a buttery, rich, and delightful Foie Gras (Foie Gras [Fwah Grah] is the liver from a goose or duck who has been forced-fed for months so that the liver becomes fatty). For dessert we enjoyed their Twenty-Layer Crepes Cake Brulee, which is a crème brulee style cake with 20 layers of crêpe and organic whipped cream. I took home a slice of their dark chocolate cake, which made an exceptional addition to a hot fudge sundae I made a few days later for an extra special person in my life.